Austerity is being used as a smokescreen to reduce the share of the many and increase the share of the few. 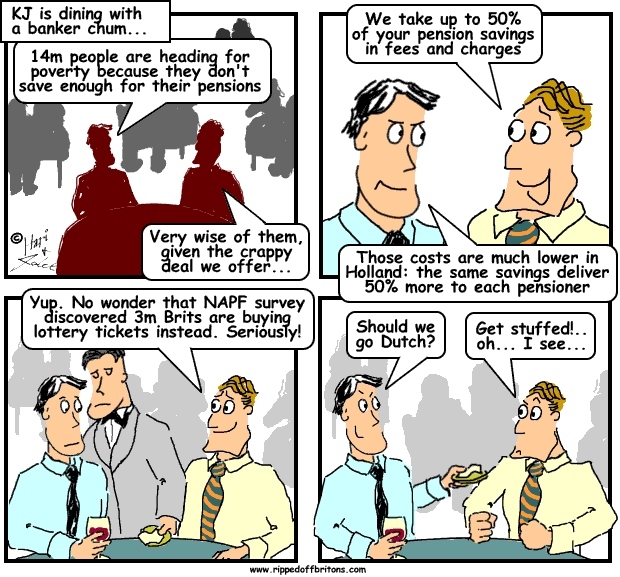 It is happening with wages, with benefits, and with pensions. All under the smokescreen of 'unaffordability'. Take a look at the three graphs below showing how we are being bamboozled over the cost of pensions. The graph below, produced by the National Audit Office shows the increase in real cash terms. Of the three figures, the most relevant is the 1.4%, as that shows how GDP is being shared out. Remember, the reason for the leap as a percentage of GDP in 2008 is NOT pensions going up but GDP going down due to the banker induced crash. (To explain: if you have an income of £100 and you spend £10 on milk, you are spending 10% of your income on milk. If your income (like GDP is a nation's income) drops to £80 and you still spend £10 on milk you are now spending 12.5% of your income on milk even though you spend the same amount of hard cash). The crash in UK GDP between 2007 and 2009 is the reason expenditure on pension as a percentage of GDP jumped in that period. Crucially you will notice that UK GDP is recovering, which means the cost of pensions as a percentage of GDP will fall in the future. So the government is in a hurry to get the bamboozlement legislated and slash pensions before this becomes known. Retweet this post so people will know sooner. Austerity is being used as a cover for cutting the share of the nation's wealth that the rich give to the elderly. Cuts now will impact pensions for decades into the future. Which means every one of us will be ripped-off by this scam when we eventually get to collect our pensions. An employee and employer paying in £20 each to a pension fund with approx 20% tax added as well so £48 a week and with a 1000 employees and a yearly payment into the fund of £2.5 million would now be worth £15 million x 30 years = £450 million excluding compound interest / gains, excluding increases into fund and excluding pay outs to existing pensioners. Don't tell me that decent pensions aren't viable.